When it comes to choosing your builder, you may need to collect a number of quotes, for which some companies may charge. While this may seem unnecessary, paying a small charge for a quote early on in the process can save a lot of trouble down the line. Here at Smartbuild, we will not compete to present you the lowest price. While we are more often than not competitive in pricing, we won’t compromise our standards in order to win you over. That’s why we take an approach from the outset that lets our prospective clients know we are serious about our business, our customers and the outcome of their projects. Our team always puts the highest level of quality and attention into everything we do, including tenders. 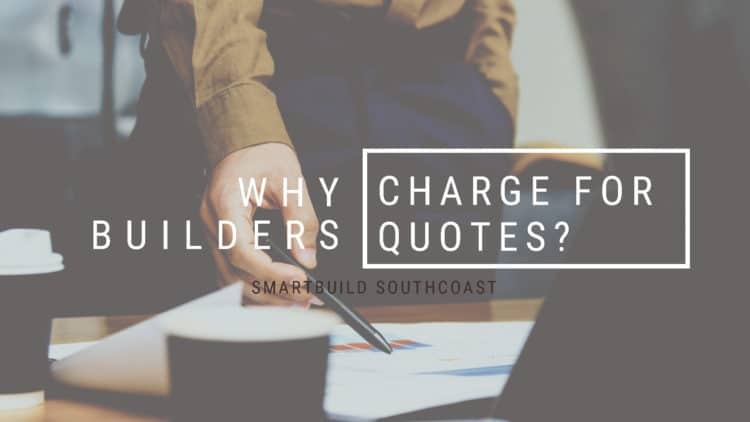 There may be other builders that provide free quotes – this is usually because they apply a m² rate and don’t go to the effort of producing a bill of quantities, or sourcing quotes from suppliers and sub-contractors. This practice often leads to unnecessary variations, disappointment and disputes during construction, not to mention extension of the construction period, costing you time and money. We like to provide a personalised and transparent service with a tender that will give you confidence and certainty that your project will be completed to an exceptional standard, on time and on budget. There is a significant amount of time, effort and expense that goes into preparation of a detailed and specific tender. In order to be able to provide this level of service, we require the payment of a nominal fee. The payment of this fee also means the quote belongs to you. We encourage you to source other quotes and invite you to compare us (our service, our past projects and resulting testimonials, our approach and our price) with other builders. We offer two different types of tenders – a preliminary cost report and/or a detailed cost tender. I always encourage my clients to undergo a preliminary cost report prior to lodging a DA with the council. This ensures that the project is not outside your budget and that you don’t go through the entire DA process and all the fees associated to find out that the budget does not fit the design. If we can flag this early, we can work together with the designer and you to ensure the budget is realistic and you can move forward to lodge the DA with confidence. This preliminary cost report is usually more than 95% accurate – note, it is impossible to achieve 100% accuracy at this point as we have no engineer details, selections and detailed plans. The second option is the detailed cost tender. Once we have DA approval, geotechnical soil reports, engineer plans, specifications, selections, colours and detailed construction certificate plans and sections, we can then undergo the detailed cost tender. This is a fixed price quotation that is essentially the entire cost of the building work, down to the minor finishes like towel rails and toilet roll holders. If you proceed to work with Smartbuild South Coast, all the preliminary/quote fees will be deducted off the first progress payment, meaning this service is ultimately free. Whichever builder you choose, requesting a quote is a great way to test their attention to detail and quality standards, giving a great indication of their work as a whole.